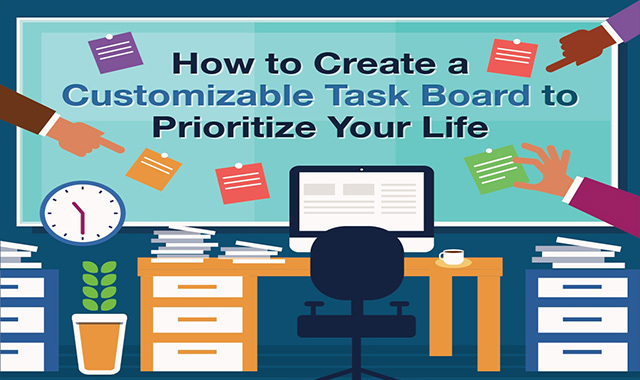 How to create a customizable task board to prioritize your life #infographic ~ Visualistan '+g+"
Staying organized at work and at home has its obstacles. Stacks of ongoing to-do lists can get messy and cumbersome, whether we’re talking about daily chores around the house or big team projects at the office. Task boards simplify project management with a tangible, visual framework. You can use a task board to manage individual tasks or team tasks. Task boards come in a variety of shapes and sizes and you can customize yours based on your needs. The base can be made from poster board, cork board, windows, sheet metal, and more. Sticky notes are a staple for many task boards because they are easy to move from one step to the next. You can also use different colored notes to signify different priority levels or different types of tasks. Ready to make your own task board? Read on for more ideas and tips.